What do we mean by "Second Mile Service?" 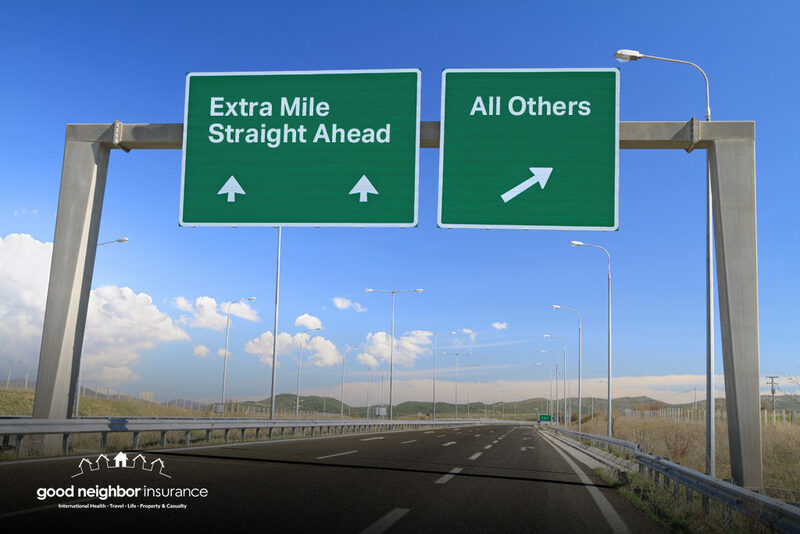 Good Neighbor Insurance “second mile service” and going the extra mile. What makes Good Neighbor Insurance customer service unique? Our competitors choose to follow an “internet-only” sales channel, trading volume and singular options for customer service and “best fit.” We chose to put the customer first. Which means direct phone lines (no phone trees) and multiple options from different carriers, so that we help you find the best fit and coverage for your unique needs. Did you know: You don’t pay a penny more for our service? It is especially helpful if you have a claim issue or question, and get the ‘run-around’ rather than the right person at an insurance office. We have direct lines and can get your questions answered due to our close relationship with carriers and our volume of sales. We also try to avoid lots of loaded “insurance-ese” and industry-talk. As travelers ourselves, we try to use everyday language and explain our terms so that you understand what you are getting. We also have learned to ask the right questions so we don’t waste your time. Usually, with just a few questions, our team can highlight one or two insurance plan choices that should fit your needs and keep you safe at a very affordable rate. When you go direct to a carrier or make a choice from an “internet-only” company, you are left wondering if these individuals are licensed, if they really know their products, and if there might have been another, better choice, if you had kept looking. By offering plans from more than 1o carriers, we know the marketplace and are proud of our perfect record with the BBB. Our help and expertise especially come in handy if you travel as a volunteer, travel as a missionary or short-term missionary, are an international non-profit needing group health insurance or are a social good business. Most of our staff have served overseas as well volunteering and working long-term overseas to make the world a better place and to help specific peoples address specific problems. If we can help you as well, we’d love to get to know you better. Join those who have learned that having a “good neighbor” is as good as a reliable family member when you are in need. If you have any questions, please feel free to reach out to us at info@gninsurance.com or Skype “good neighbor insurance”.